Chen Zhonghua was born in the winter of the third year of the “Three Bitter Years” (1961), a period of famine, drought and floods that left millions of people in China dead. While his mother was pregnant with him, she and the rest of his family suffered from starvation. The situation was so bad that the landscape of China was completely devoid of life. Anything that moved or grew was eaten. Out of necessity people had taken to eating leather and the bark from trees. As a result of these conditions Chen Zhonghua was born small and weak with severe health problems including damaged lungs. He was not expected to live into adulthood. At the age of one and a half Chen Zhonghua developed acute asthma. Poor health kept him home and indoors for the first nine years of his life. From Grade 1 to Grade 5, he went to school for only half of the year while chronic bronchitis kept him from attending school at all during the winter months.During this time, the main illness was with his heart, liver and lungs while he also suffered from arthritis. These desperate circumstances lead to his determined pursuit of martial arts as a way of strengthening himself and alleviating some of his chronic health issues. Also, being very small he was on the receiving end of harassment from larger friends so learning a martial art was also a form of self preservation. Unlike most Chinese martial artists, (Joseph) Chen Zhonghua did not start his career at a preteen age and he did not start with the natural talent in martial arts that most masters claim to be born with. Initially, he did not have enthusiasm for the martial side of the art and he was not destined to be a great master from birth because he was not born into a recognized martial family. Driven by the strong motivation and determination that his ill health gave him, he began his martial arts training with a hand copied manual of army combat training techniques borrowed from a friend. As he gained strength he began to study with more experienced people. He learned Sitongchui (Four-Open-Fist) from a local master; Baji and Taizu from a neighbor; Xiao Wushou (Small-Five-Hand); and Da Wushou (Large-Five-Hand). With persistence, practice and training, Chen Zhonghua gradually gained normal health. He gained strength, put on weight and began to look more like an ordinary young person. With this gain in confidence and the emergence of some skill his kung fu exploits began. He organized the young people studying with him into groups and coached and trained them. Each group would compete with other groups. The beach along the Hongning River banks became their meeting place everyday after school. There were times when things got rough and Chen Zhonghua would be called on to discipline the trouble-maker. His reputation in martial arts started to spread in his town. In 1978, most of his groups were recruited to be on the school team that competed in the Weifang District wide martial arts competition held in Wulian County. They played a major role in ensuring that their county, the host county, finished the event with the most awards. In 1979, Chen Zhonghua somewhat reluctantly attended Shandong University in Jinan (he would have preferred Beijing) after graduating with the highest English marks out of seventy-six million students in his district. This proved to be a turning point for his Taiji education. It was in this year that he heard of the amazing skills of an elderly man teaching Taiji in a park in the mornings. His subsequent visits to the Black Tiger Springs Park convinced him that Hong Junsheng was a man of real gong fu and that his Taiji was worthy of learning. His first visit to Black Tiger Springs Park was on a Sunday. He arrived at about 9 o’clock in the morning. Black Tiger Springs is at the mouth of a small river created from a rising underground spring. There are walk ways on both sides of the springs while cliffs mark the outer edges of the walk ways. On one side there is a small plaza dominated by two large carved tigers. Walking up a steep stairway above the tigers takes you to a raised platform that overlooks the entire spring’s area. It is here that Chen Zhonghua first met the famed Taiji master, Hong Junsheng. People were leaving the park as Chen Zhonghua arrived, but there was still a small crowd on the raised platform above the tiger’s mouth. As he approached the crowd, he realized that it was a group of Japanese visitors who had been studying with Hong Junsheng. They were watching a demonstration performed by one of the visitors, a rather stout and dark looking young man. He was fast and intense with his form. His eyes were a beam of light on his hands. His hands were both purplish and he pounded the floor loudly. This was great! Chen was immediately impressed. Power, that’s what he wanted! Then a Japanese visitor went up to an old man with white hair. Through an interpreter he expressed his wish to experience the old man’s skills, claiming it would be a great loss if he went back to Japan without experiencing those great skills. The old man was standing with his legs quite close to each other. It was not a martial pose at all. He was smoking a big pipe with his left hand which left his right hand free. He was facing the Japanese visitor with the right side of his body. Through the interpreter, he told the visitor to try whatever he wished; he would not fight back, he would only defend himself. Seeing that the old man was not preparing for battle, it took a lot more interpreting and discussion before the visitor was convinced that it would be safe to attack. The visitor threw a punch at the old man’s face. The old man turned his body a bit, meeting the fist with his right shoulder. On impact, the visitor flew up and back, away from the old man. He was at least ten feet away when he landed. He stepped up to the old man again, obviously uninjured. “I do not know what happened,” he said. “Could I try the same move on you again?” Again, he flew back and landed on the same spot. Frustrated but not giving up, he tried a third time and ended up on exactly the same spot. His face showed total perplexity. Joseph Chen, standing among the watching crowd, was deeply impressed and puzzled. He was determined to find out the gong fu that was behind this impressive show of skill and control. As he would later find out, Hong Junsheng was an 18th generation Grand Master of Chen Taijiquan who had studied with the legendary Chen Fake the longest of anyone. For the next six years, Joseph Chen became a frequent visitor to the Black Tiger Springs Park, arriving there at 4:30 every morning, rain or shine. With persistence, he started out as a spectator, but soon became a student among a large morning group. In a few years, he was learning from Grand Master Hong in the morning and from Hong’s senior disciples in the evenings. He was eventually accepted as a disciple of Hong. In Chen Taijiquan there are two main empty hand forms, Yi Lu (first form) and Er Lu (second form), also known as Cannon Fist. Most masters of authentic lineage advocate that the first form be studied for five to seven years. Even before learning Yi Lu the fundamentals or foundations of Taiji must be laid by intensive study of the two circles that encompass all the movements of Taijiquan. Under the tutelage of Hong, Chen Zhonghua would drastically change his learning style. He would concentrate on perfecting the essentials before moving on to other forms. He would practice the two circles for two hours in the morning and then the Yilu form twenty times in the evening. He lost the desire to learn more forms and would only continue to work on the few fundamental exercises day in and day out. He would exercise by shaking a ten foot waxwood pole until he was sweating while wearing a thin shirt in minus twenty degree weather. At one time he practiced the sword form so intently that without knowing, he inadvertantly cut himself with the tip of the sword and a huge scarred indentation was made above his ankle. After graduating from University in China Chen Zhonghua immigrated to Canada and became enrolled at the University of Regina in Saskatchewan. He graduated in 1981 with a (Masters in Education?) and moved to Edmonton, Alberta where a teaching position with the Edmonton Public School Board at Victoria Composite High School waited for him. Since 1985, he has been teaching Taiji in Canada. His disciples and students have competed in China and in Canada earning top honors with gold, silver and bronze medals. By 1994, he had learned the entire curriculum of grand master Hong’s Chen Style Taijiquan System. “Don’t Touch Mr. Chen” was the rapidly spreading caution at Vic Comp High School in Edmonton, where Chen Zhonghua had begun his teaching career. He started a martial art club at the school when he assumed teaching duties of Social Studies and English as a Second Language in 1988. Soon his reputation was known among students and teachers. French language teacher Mrs. Stone is a friendly and touchy-type person. One day while walking in the hallway behind Joseph Chen, she decided to play a trick on him. She went behind him quietly and suddenly tickled his back at the waist. As soon as she touched him, she was thrown back onto the floor to the delight of the many students who came to see what happened. Later on, Joseph Chen recalled that he instinctively used the “The Whip Wrapping around the Body” pose when Mrs. Stone was thrown. Mr. Jack is the head of Social Studies department. He used to be a physical education teacher and was still known for his toughness in the school. He was big and strong and lifted weights daily, managed the school weight room and played and coached football and hockey. One day in the staff dining room, Mr. Jack asked Mr. Chen whether all that talk about his Taiji was just TALK. “That slow stuff couldn’t really work on someone strong, could it?” As he was talking, he tried wrapping his arms around Mr. Chen. Somehow he could not subdue Mr. Chen who ended up having his right palm firmly planted on Mr. Jack’s chest. “This is why Taiji works,” said Chen. The next day, Mr. Jack was showing everybody in the staff dinning room his chest on which was the red imprint of a small hand. In January, 1996, Grand Master Hong Junsheng passed away at the age of 90. Chen was devastated! He had just embarked on his journey and now his guide was gone forever! Chen became a lost soul. He would not talk about Taiji, he would only train hard by himself as he was grieving intensely the loss of the master that had meant so much to him. Without Taijiquan he would be nothing. Without Hong Junsheng, could there be Taijiquan for Chen Zhonghua? He grieved for for two years. At the same time he started searching for another master to guide him. The search was difficult. There was nobody that could match Hong’s ability and meet Chen’s desires for learning. He remembered his master’s last words and decided to go to Beijing to see Grand Master Feng Zhiqiang. This was a tough decision. Everything he knew he learned from Hong Junsheng. Hong Junsheng was too much on his mind and too much in everything he did. Is it possible to learn under another master? In 1998, Chen formally became a disciple of Grand Master Feng Zhiqiang. This came as a result of a fortuitous introduction to Grandmaster Feng’s daughter who was visiting Edmonton and his subsuquent persistent visits to Feng, demonstrating his desire and worthiness to be a disciple. At the time he was accepted, he had already studied the entire curriculum privately. Since 1999, Chen Zhonghua publicly has taught the arts of both his teachers. He instructs Chen Style Practical Method of Hong Junsheng and the Chen Shi Xinyi Hunyuan Taijiquan System of Feng Zhiqiang. On June 18, 2004 the author was in attendance at an event in Jinan when Chen Zhonghua was given the status of International Standard Bearer by members of the Hong family and senior disciples of Grandmaster Hong Junsheng. I watched as Hong family members (Hong Youren and Hong Youyi) spoke of their father’s Taiji. They spoke of how it was appropriate that the hard work and dedication to following the rules of Taijiquan had lead Chen Zhonghua to gain the skill that qualifies him to be a leading representative of Chen Style Practical Method Taijiquan internationally. Speeches were given by Hong’s sons and Hong’s grandson demonstrated Yi Lu for the gathering. The Standard Bearer, Li Enjiu, also gave a speech and later demonstrated applications with one of his top disciples, Master Ding. Some of Master Chen Zhonghua’s disciples and students were fortunate enough to be in attendance beside myself: Ronnie Yee of Regina with his discple Scott Elash and several students, Roy Dawson and Colin Lee from Winnipeg, Kee Hong from Ottawa, Richard Johnson and Jesse Thomas from Arkansas, Jerry Arsenault from Nelson, B.C., Yaron Seidman and his disciple Mathew Landau from New York and Connecticutt, Todd Elihu and Carl Lindberg from Georgia, Charles Paoletti from L.A., and Ricky Aguilar from Texas. Grandmaster Hong Junsheng’s eldest son came all the way from Cangzhou to present Chen Zhonghua with the certificate, though he was still recovering from a recent heart attack. Most of Grandmaster Hong’s senior disciples in and around Jinam came to the occasion. They include Li Enju, Xu Guicheng, Meng Xianbin, Liu Xiuwen, Li Shufeng, Ha Lezhi, Chao Xiuzhen, Cai Shengye, Pang Yuzhu, and Zhan Dingguo. Masters Cai Shengye, Li Enjiu, Xu Guicheng, Meng Xianbin, Hong Sen, Ding Mingye, Wang Hongping, Du Lingong, Liu Xiewen and Ha Lezhi all gave demonstrations and lectures. When I first met Chen Zhonghua I approached him with considerable skepticism. In 2001 I had been studying the internal arts for twenty years and had not met anyone that lived up to the martial reputation that Taiji has. Spurred on by friends I grudgingly attended a workshop that Chen Zhonghua was teaching. Chen Zhonghua is not a large man. Certainly he is nowhere near as physically strong as I am and weighs only slightly more than half of my 215 pounds, yet he is capable of controlling my every movement with ease. In one of my first encounters with Master Chen he performed a very light motion on my forearm that made me very grateful that he is a gentle man. Only a slight increase in pressure would have broken my forearm easily. At a later workshop he performed a similar movement where he lightly placed a palm on my upper back and stepped his foot inside mine. With the slightest movement from him it felt as though my spine would have been severed horizontally had he not been cautious. Since my introduction to Master Chen I have pushed hands with him many times and have often heard him say, to me and to others, ‘do whatever you want’. He will allow anyone to tie him up by applying joint locks to him or simply holding him tightly, preventing any normal person from being able to move or escape. Invariably as soon as the person attempting to control Master Chen says they are ready, they are on the ground in a second. Master Chen truly embodies the art of Taijiquan. During our 2004 trip to China I witnessed an event that had me scratching my head for months afterward. We were in the city of Heze, being hosted by Master Chow and his students. Master Chow was helping us to celebrate Master Chen’s new status as International Standard Bearer and part of that celebration was form demonstrations by the hosting group, followed by our group. The forum was a large room in a business class hotel in Heze. The floor of the room was quite slippery and several of the people demonstrating had trouble keeping their footing. Thinking that a carpet would provide more grip for the next group, a large red carpet was rolled out and the next group performed their demonstration on it. It was a disaster! The carpet made the grip even looser and everyone slid around on the carpet, bunching it up and frequently losing their balance. Master Chen was slated to demonstrate next, but before he did some of the Heze people came to remove the carpet realizing that the slippery floor was a better bet. Master Chen waved them off and chose to demonstrate on the carpet. Thinking that this would be interesting and brave of him I settled in to watch what would happen. We have the event captured on film and I have watched it several times since. It was better in person, but what unfolded was one of the fastest and most powerful demonstrations of Yi Lu that I had ever seen. As Master Chen stamped his feet and fa-jinged his way through the form, the entire room shook from his power. The carpet never moved except once when I saw one very tiny fold begin that was straightened out with his next movement. The carpet never moved again. Not only was I impressed, but many of the Heze people stared, open-mouthed as Master Chen performed. How can one move with such speed and power on a slippery surface and seem to stick to the floor through the slippery carpet. His incredibly strong and sophisticated root is the only answer. On a different trip to China a good friend of mine witnessed the following event and related it. His group was staying in a Beijing hotel. As my friend was exiting his room one morning he saw one of his fellow students spinning down the hall and around a corner without his feet touching the ground. Rushing over to where Master Chen and several other students were standing close to the elevators my friend asked about what he had just seen and wondered if Master Chen could do it to him. “I think so” was the reply. My friend and Master Chen joined hands and in a second my friend was propelled down the hallway and around a corner into a utility room. He tells me that he still has no explanation for how he was spun out in such a controlled way. Since 2002 Chen Zhonghua has been teaching Taiji as his full-time occupation. As a result of increasing interest and demand for his teaching skills and abilities, Chen Zhonghua has become one of the most sought after instructors of traditional Chen Taiji throughout the world. He currently has students and disciples in such varied locations as Canada, the United States, Europe and China. He has been featured in magazines such as Inside Kung-Fu and T’ai Chi Magazine and has translated into English Grandmaster Feng’s Qigong book while publishing “The Way of Hunyuan”, a book describing his life and Taiji experiences while pursuing Qigong. He has also recorded numerous educational videos showing many aspects of his Taiji and Qigong knowledge for people without an instructor or those needing further reference for details regarding his instruction. In addition he sponsors several websites to further add enrichment and knowledge to the Taiji community. In 2007 he published a translation of Grandmaster Hong’s book on the theory of Chen Taiji. His experience as a translator and his high level of expertise and understanding of the Chen Style Practical Method made him the perfect person to be allowed by the Hong family to translate this gem of a book into English making it more available to the world. 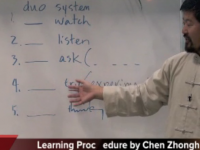 As part of his time teaching, Chen Zhonghua began instructing three month “Full Time” Intensive Courses in 2002. These Full Time Courses have evolved to now being conducted on Daqingshan Mountain in Shandong province, China. Many of Chen Zhonghua’s disciples are graduates of these Full Time programs. He is the official Canadian correspondent for the Hunyuan Taiji Magazine which is the official magazine for Grandmaster Feng of the Zhiqiang Martial Arts Academy of Beijing. He is the honorary principal of the Weifang Praying Mantis School. He delivers special dedicated Taiji seminars in Vancouver, Victoria, Saskatoon, Regina, Winnipeg, Toronto, Ottawa, Boston, Dallas, Atlanta and many other North American cities. He also has occasional European seminars in Dublin, Amsterdam and Paris. Chen has also contributed to the Taijiquan community by serving as a judge at A Taste of China in Winchester, Virginia (1998, 1999), Taiji Legacy in Dallas (1999), as a vice chief judge at the Jinan International Martial Arts Festival (1996, 1999), and many other international events. Regarded as one of the few North American 19th generation Chen Style Taijiquan Masters, and also a Second generation Hunyuan Master, Joseph Chen’s quest for enriching and pursuing the art of Taijiquan continues. He is enthusiastically supported by his wife, two daughters, Disciples and many students who realize the tremendous burden and responsibility he carries.